Major Millions is a Microgaming progressive slot with a military theme, a progressive jackpot, and plenty of lucrative bonus features. This game can transform players into millionaires if they get lucky. Major Millions is a progressive slot with 15 paylines and a fixed coin bet of $0.20 per active payline. Players need to place the maximum bet of $3.00 per spin of the reels in order to qualify for the progressive jackpot. After placing the bet, players can hit the Spin button to set the reels spinning. If a winning combination of icons is displayed on the reels at the end of one spin, players can collect a payout. Players can play Major Millions in the regular mode or the expert mode. The expert mode includes a number of advanced features such as Autoplay, Spin 5x, and Spin 10x button. While players can use the Autoplay option to spin the reels automatically, they can use the Spin 5x and the Spin 10x options to spin the reels for five and ten times, respectively. 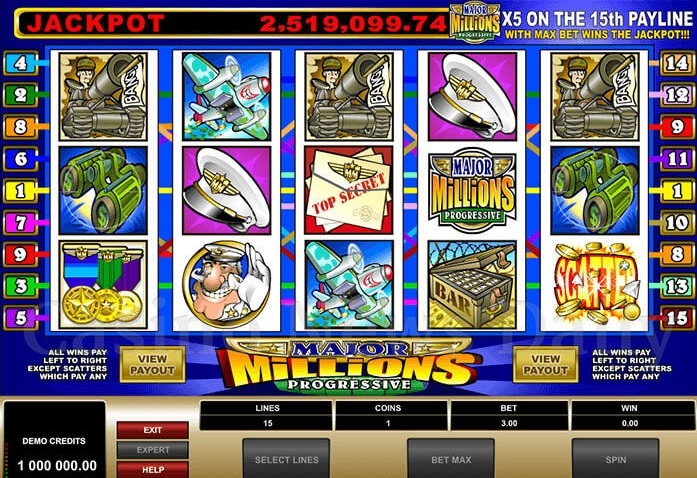 Major Millions is the ideal slot for luxury lovers who love military themes with a comic twist. The online slot features astounding graphics and symbols of the Major, airplanes, battleships, tanks, ammunition, medals, secret letters, field binoculars, major’s hats, and others. The sound effects are well in keeping with the slot’s military theme and very entertaining. The bonus features and progressive jackpot encourage players to stick to the slot for long hours. Major Millions enjoys a great deal of popularity because of its progressive jackpot. However, players need to bet maximum in order to qualify for the jackpot. Players not only have to bet max, but also line up five Major Millions Game Logo icons along the 15th payline in order to win the progressive jackpot, which has a seed value of 250,000 coins. The Major Millions Game Logo serves not only as the wild, but also the multiplier. If players use the Major Millions Game Logo icon to complete a winning combination, their payout for that combination will get tripled. If players land a combination of five Major Millions Game Logo icons along any of the first to fourteenth paylines, they will win the top fixed jackpot of 8,000 coins. However, players should note that the top fixed jackpot and the progressive jackpot do not get tripled. The Explosion symbol serves as the scatter. If players land combinations of 3, 4, or 5 Explosion scatter symbols anywhere on the reels, they will win scatter payouts of x3, x10, and x50, respectively. Although one of the older slots in the Microgaming portfolio, Major Millions is still popular. It comes in two variants—the five-reel variant and the three-reel variant, both sharing the same progressive jackpot.